In the past, economies have benefited from technology. But these shifts occurred over decades. Today, the cumulative effect of technology is an exponentially accelerating progress through a driving force of technological and social change, productivity, and economic growth. Technological transformation and development are predicted to both significantly create as well displace jobs. Labour requirements and skill sets will be discriminating. Vulnerable and marginalized populations could face a ‘double disadvantage’ in the future, due to a lack of awareness of or means to adapt to these changes. Accenture report ‘New Skills Now’1 has put a framework to the new skills that would be required today and for next 10 years to come to enable work force to be relevant to the then available jobs. The report also states that 65% of children starting school today will hold jobs that don’t exist yet.1 While we can debate on the appropriate percentage, there is no taking away from the fact a completely new set of skills is going to be a reality. Taking a cue from the Accenture report, the ‘3 New Skills Now’, a subset of the 6 essential skills identified for the work force could be extended to school-going children as well. The Indian Education system is among the largest in the world, with about 260 Million children enrolled in classes 1 to 122. 45% of the school-going children, around 113 million, continue to get their education from government schools3 according to the District Information System for Education (DISE). In the recent budget session, Finance Minister Mr. Jaitley mentioned about integrating the school education sector from pre-nursery to Class 12 and bringing together all the education schemes such as Sarva Shiksha Abhiyan (SSA), Rashtriya Madhyamik Shiksha Abhiyan (RMSA) and Teacher Education (TE) under one umbrella. The total outlay for education is set at ₹85,010 crores. The government is also planning to increase the digital quotient in the education sector with Technology being the biggest driver in improving quality of education. The underlying mantra is to move from the blackboard to a digital board. That the Govt. is serious, is evident from large-scale reforms suggested such as Revitalising Infrastructure and Systems in Education (RISE) scheme with a budget of ₹1 lakh crores. The proposal for the new education policy 2016 emphasizes improving learning outcomes in elementary education, extending out reach of secondary and senior secondary education, reforming school examination systems, and re-vamping teacher education for quality teachers etc. The key to improvement in quality of education is to have better qualified, better trained, better-motivated and more accountable teachers. The poor quality of School education is a direct result of poor quality of teacher education and teacher training. The government has amended the Right to Education Act to enable more than 13 lakh untrained teachers to get trained as per this budget. Further, to foster curiosity, creativity, and imagination in young minds, GOI has introduced Atal Tinkering Labs (ATL’s). ATL’s are innovation play workspaces for students between Class 6 to 12, stimulating innovation combining science and technology. ATL work spaces are fitted with state-of-the-art technologies like 3D printers, robotics, sensor technology kits, Internet of things (IoT), miniaturised electronics. These labs help students find solutions by exploring and experiencing design thinking and innovation, a do-it-yourself approach. As part of their CSR initiative, SAP will adopt 100 Atal Tinkering Laboratories (ATL) over next 5 years. SAP employees will volunteer to coach and mentor students on advanced technology topics. Dell as part of their CSR also supports the ATL initiative. Notwithstanding the Government drive in digital education, it is important to recognise that the 113 Million school going children are at different levels of learning, and inconsistency in learning levels exists in India. This has been reiterated by the Annual Status of Education Report (ASER) in unequivocal terms. Foundation skills (New Skills 1. Learn to Earn) at a basic level is a high ranking priority. Introduction of an ICT based Curriculum is not a choice but a prerequisite. ICTs can be used to reinforce existing pedagogical practices as well as to change the way teachers and students interact in classrooms. 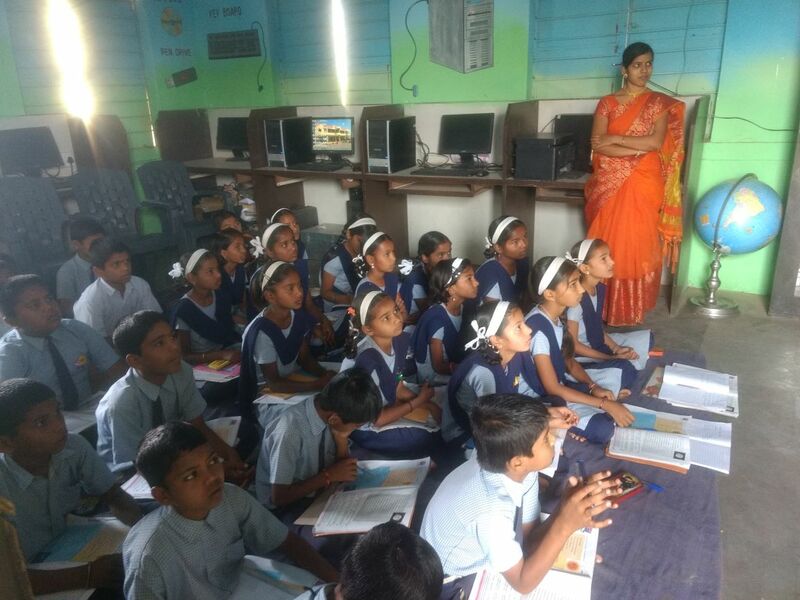 Under the CSR banner, many Corporates such as Avaya, Tech Mahindra Foundation, Intel, Dell to name a few are supporting ICT based education in Govt schools. Their initiatives, however, barely scratch the surface of the Indian education requirement. The key to elementary education lies in the fact that learning should be made joyful, creative, participatory, and stimulating. (New Skills 2. Create and Solve) can be achieved through well-rounded curriculum (confluence of art and science). Art in Education helps to engage students and reinforce academic concepts. There is a need to include softer aspects of mathematics as subjects in art curricula. It is believed that math, like art, starts with a vision and manifests into reality through the right technique, like science. New Skills 3. Cultivate a growth mind set – Cultivating adaptability characterized by resilience, and a love for learning – can this be achieved through a curriculum change? To stay relevant, continuously learn and grow, and adapt to change underscore all other skills for students to successfully navigate the future and ever changing world of work. Stay relevant by staying curious is the new mantra for 21st Century.